This article will tell how to resize disk partition (including system partition or data partition) in VMware on Windows Server 2008. Download IM-Magic Partition Resizer Server to resize disk in VMware when on Windows 2008 when Virtual disk is running on low disk space. VMware can support almost all Windows operating systems, which makes computer work in a Virtual environment but has the same function like a real machine. During the usage of VMware, the Virtual disk will run out of disk space. If virtual disk is running on low disk space on Server, you still need to resize the disk to fix the problem. In addition to relying on Windows built-in disk manage tool, you can also use professional partition software IM-Magic Partition Resizer Server to resize the virtual disk. Download, install and launch the IM-Magic Partition Resizer Server on your computer. 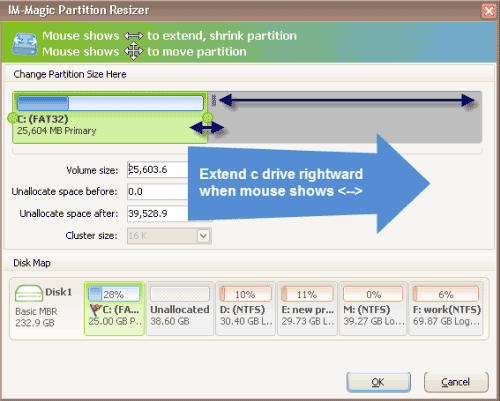 Right click a partition that has lots of free space on the Virtual disk and select "Resize/Move" option. You need to move the unallocated space close to the partition that is running out of disk space, and then right click this partition and select "Resize/Move" option. VMware disk can run out of disk space when more and more data is stored. When C drive is running out of disk space on Windows Server 2008 VMware, you may doubt if you can resize the virtual disk to extend C drive. Will you worry that it may cause any trouble to your computer due to C drive low disk space warning? How can you resize the C drive in VMware on Windows Server 2008? Do you need to reinstall VMware in order to resize C drive? Will you lose all data stored on the virtual disk after disk resizing? If you run into C drive low disk space problem on Windows Server 2008 VMware, IM-Magic Partition Resizer can help with the partition resizing. This partition software can work on virtual disk to resize C drive without touching any data or hurting operating system. By using this partition software, you can extend C drive space without reinstalling system or rebooting your computer. Therefore, this partition software is an easy-to-use and efficient partition tool for disk partition resizing when you encounter low disk space issue. 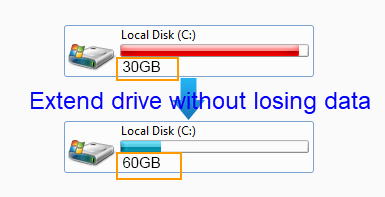 If there is free space on other partitions on the same Virtual disk, you just need to rely on IM-Magic Partition Resizer Server to shrink other partition to produce some unallocated space and then add the space to C drive. If there is no free space or there is no other partitions on the Virtual disk, you need to extend the Virtual disk in order to resize C drive. If data volume on Virtual disk is lacking of space on Windows Server 2008, you can also use IM-Magic Partition Resizer Server to increase the size of partition without formatting the disk. You can move free space from other data partitions to increase the partition size. You can also move free space from C drive to add to the data partition which is running on low disk space. As long as there is enough free space on the same Virtual disk, you can get any partition extended easily. However, if there is no free space on the same Virtual disk, you may need to expand the Virtual disk size before resizing partition. "I have installed Virtual machine with 10GB hard disk, and I installed Windows Server 2003 OS on it. Now the virtual disk is running out of disk space and I cannot install any software. Can you tell me how to resize the Virtual disk without deleting any data or uninstalling any program?"